There are few topics more passionately discussed and debated than that of health care in the United States. The ability to receive necessary care in our greatest times of need is of vital importance. But there are a growing number of people that, for a multitude of reasons, struggle to find or afford such proper medical aid. Enter Honor Community Health, an organization established in 2012 to provide top- level care to patients that otherwise might have fallen through the cracks. As a Federally Qualified Health Center (FQHC), grants are received via state and federal government to help serve many of the uninsured or those on Medicaid. 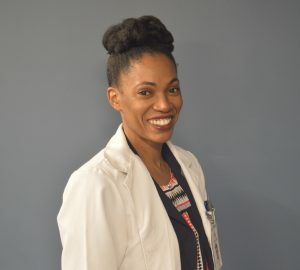 Originally from Toronto, Dr. Austin came to Michigan for medical school and then stayed in Southfield for her residency at Providence Hospital. Austin moved on to St. Joseph Mercy Oakland and she’s been in Pontiac ever since. Working with Honor Community Health has brought her much professional satisfaction. For many individuals in need, it might sometimes feel as if there is nowhere left to turn. Honor Community Health is there; providing an open door, a warm smile, and Dr. Latoya Austin’s helping hand.